Used Audi A4 Review - 2002-2005 | What Car? What's the used Audi A4 sports like? 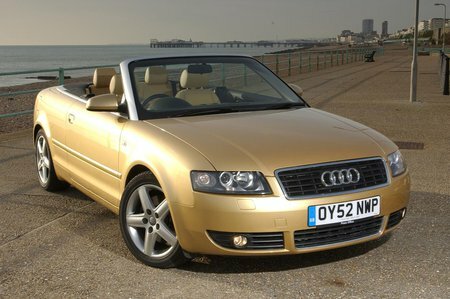 The Audi A4 Cabriolet is good-looking and impressive, inside and out, leagues ahead of the old Audi Cabrio, which used a chassis and running gear dating from the 1980s. Audi combines chrome highlights, high-quality plastics and plush fabrics to make an interior that begs you to spend time in it. Its electric hood operates tidily, but also keeps out the elements when you need it to. There's proper space for four adults and – a rarity, this – enough room in the boot for their luggage. The dash is very clear, and the wheel and driver's seat adjust finely in every conceivable way. You can even raise or lower the roof on the move - but only at speeds up to 20mph. The A4 Cabrio's not thrilling to drive, but it does everything competently, especially on models from 2006 onwards, which had suspension changes that made them more engaging to drive. The ride is composed, although deep ruts can catch it out.